Grassroots Art Center courtyard. Photo KSF. Mens room interior at the Bowl Plaza. Photo KSF. The Garden of Eden is a world-renowned grassroots art site with one of the most fascinating (and bizarre) sculpture gardens in the world! In 1907, at the age of 62, Civil War veteran Samuel Perry Dinsmoor began construction of this unusual site by building a structure of limestone logs, (some up to 21 feet long) for the family home. Then, using 113 tons of cement, Dinsmoor built 40-foot tall trees to hold his larger than life figures for his sculpture garden. He stopped working on the sculpture in 1929 because he went blind. Tour guides help observers become fully aware that every part of every cryptic sculpture has meaning about Populist politics, modern civilization, and the Bible that connect like a dot-to-dot puzzle. The humor and message that he conveys through the sculptures amazes visitors. Dinsmoor also built a mausoleum to house his mummified remains! Always a jokester, he claimed he would wink at anyone who paid to tour the garden. His vision was accurate and today the Garden of Eden supports itself through admissions. While Dinsmoor was building and creating locals tried to run him out of town. 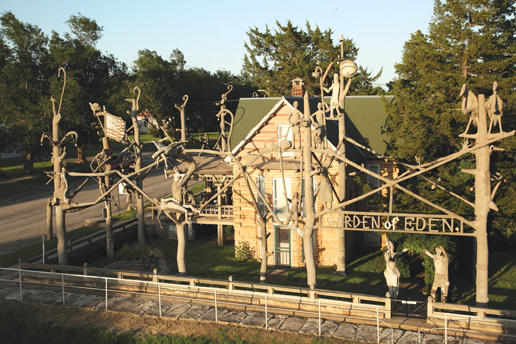 Decades later, the Garden of Eden became the town's main attraction and today Lucas is known as the Grassroots Art Capital of Kansas. Hours: May-October, daily 10 a.m.-5 p.m.; November-February, Saturday-Sunday 1-4 p.m. Admission charge: Adults $6; children 6-12 $1. Three abandoned 1897 downtown native limestone buildings were renovated in the 1990's to exhibit fascinating grassroots, self-taught, visionary art environments. Permanent exhibits include Kansas artist's Inez Marshall's brightly painted limestone sculptures and Ed Root's concrete, colored glass and rock embedded sculptures. 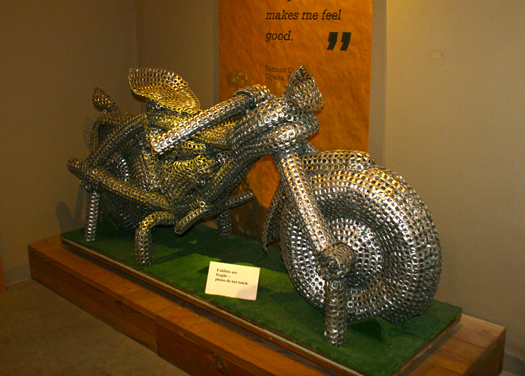 You'll see Herman Divers' life-sized motorcycle and car made so sturdily from pull-tabs that you could sit on it! In addition the art center represents over 22 Kansas and Midwest self-taught artists in an endless flow of tickle-your-fancy recycled mediums such as barbed wire, bones, and chewing gum to share with the public. Outside, the Post Rock Courtyard displays elements of distinctive North Central Kansas post-rock architecture and its artistry. The guided tour also includes two other grassroots art environments, the Florence Deeble Rock Garden, and Mri-Pilar's, Garden of Isis. Hours: May-September, Monday-Saturday 10 a.m.-5 p.m.; Sunday 1-5 p.m.; October-April, Monday and Thursday-Saturday 10 a.m.-4 p.m.; Sunday 1-4 p.m. Admission charge $6.00 plus tax for adults and $2.00 plus tax for youth 6-12 years old. For more than 50 years Florence Deeble created "post card scenes" of her favorite vacation sites by arranging and designing colored concrete and rocks in the backyard. 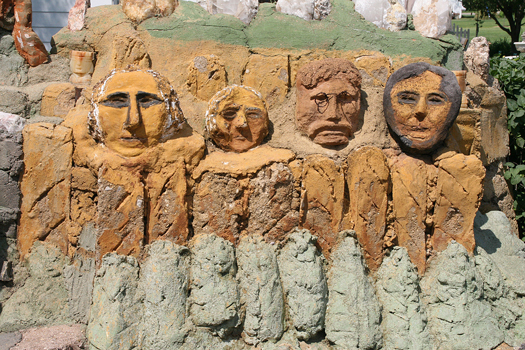 Her version of Mount Rushmore is delightful. Tour Guide at Grassroots Art Center, 213 S. Main Visionary artist Mri-Pilar has turned seven rooms of this house into an interior environment. The walls and ceilings are wrapped in silver insulation, and every inch is filled with Pilar's 3D sculptures of recycled materials. Pilar favors computer mother boards, household items, children's toys, car parts and Barbie dolls. See on-line blogs of her ReBarbs and digital dolls. This environment of recycled "stuff" is one of the most jaw-dropping places in Kansas. Pilar's "Fork Art Park" on Main Street is located just south of the Ford Dealership on Main Street. Visitors tend to come to Lucas to see Folk Art and so Fork Art was another crazy idea to have a pun with words. Tourists have been playing the Forquet game and photographing themselves in amongst the beautiful mosaic sculptural forks. Eric Abraham passed away September 7, 2013 due to complications following colon cancer surgery. His wonderful studio is closed until further notice but we will continue to pay homage to Eric and his work on this page as he was an integral part of the grassroots folk art community in Lucas. 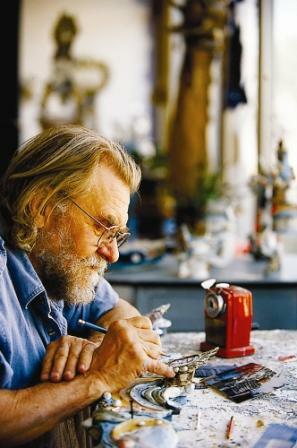 World Famous Artist Eric Abraham's fantastic ceramic creations include porcelain flying animals and custom-designed mirrors in fairytale, biblical, and other themes. It's amazing and amusing art like you've never seen before! Eric has studied art but he fits beautifully in this grassroots arts environment! Eric Abraham at work in his Flying Pig Studio. Photo courtesy Kansas State Travel & Tourism. Honoring the multiple Outsider Art environments that have flourished in Lucas since the early 1900s, the World's Largest Souvenir Travel Plates depict those environments alongside a visual history of the town. A full explanation of the iconography can be found in the Handy Dandy Guide to the World's Largest Souvenir Travel Plate page. The dish itself is 14' in diameter, formed from a large fiberglass satellite dish with another, smaller dish mounted inside as the center medallion. Lots of local help went into realizing the project, with the City of Lucas crew providing labor, cement, and engineering expertise and the local telephone company providing one of their decommissioned communications dishes. Funded by a grant from the National Endowment for the Arts, the large travel plate was painted during September, October, and a little bit of November 2006 on-site, alongside state highway K-18. Erika Nelson is the creator of the World's Largest Collection of the World's Smallest Version of the World's Largest Things. Erika Nelson is a visionary artist, educator and one of America's foremost experts and speakers on the World's Largest Things. She is a national researcher and speaker on Grassroots Art environments, Roadside Attractions and Architecture, and the World's Largest Things. 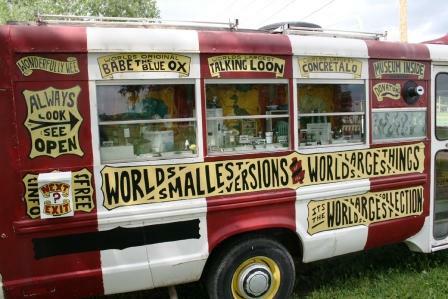 Nelson is also the founder and curator of a unique and innovative traveling roadside attraction and museum called "The World's Largest Collection of the World's Smallest Versions of the World's Largest Things." You can sometime see her traveling World's Largest Things museum vehicle in her backyard at 226 Kansas Avenue. And, while you're there you might see a rather eccentric-artist-decorated vehicle AND look up in the "Chair-y" tree. Yep, you'll see chairs in that ol' elm tree! Bowl Plaza is a quirky, eccentric public accessible restrooms designed with grassroots art principles! Recycle and reuse. The overall design is a sunken toilet. The exterior seating and architectural wall design include mosaic art work along with recycled, colored glass bottle construction which will make this another one-of-a-kind art attraction for the local community and visitors to enjoy. Photos by KSF unless otherwise noted.